I need to add an option in my theme options panel to set a specific custom menu's links all to nofollow. Does wp_nav_menu() allow this or does it require a custom walker to manually ad rel="nofollow"? 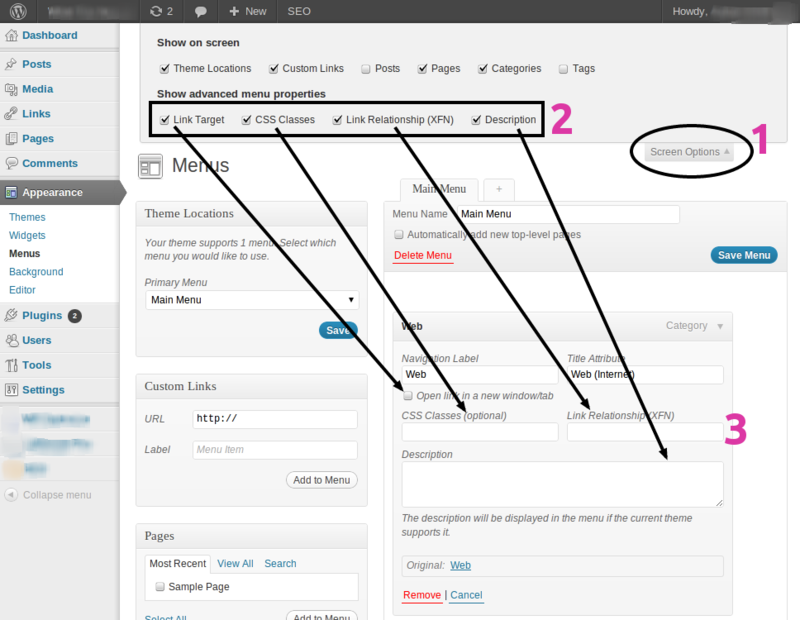 As you can see above, the Advanced Menu Properties are hidden under the Screen Options pull down tab located in the upper-right corner of WordPress Dashboard. W.r.t your question, the Link Relationship (XFN) option is what you want "check". Then the appropriate field will show up for each menu item allowing you to define its relationship (rel="____"). You can also leave it blank for some items (meaning, no relationship will be specified). Some years ago there was the only reason to use rel="nofollow" attribute on internal links — PageRank sculpting. These days are gone forever. If you don't want some pages to be indexed, use a plugin (e.g. WordPress SEO by Yoast) to add <meta name="robots" content="noindex, follow" /> to the head section of these pages. Not the answer you're looking for? Browse other questions tagged theme-development menus or ask your own question. How to add (css) classes to only one wp_nav_menu()? How to add an option for “nofollow” to the Link editor's existing "Link Relationship(XFN) options list?